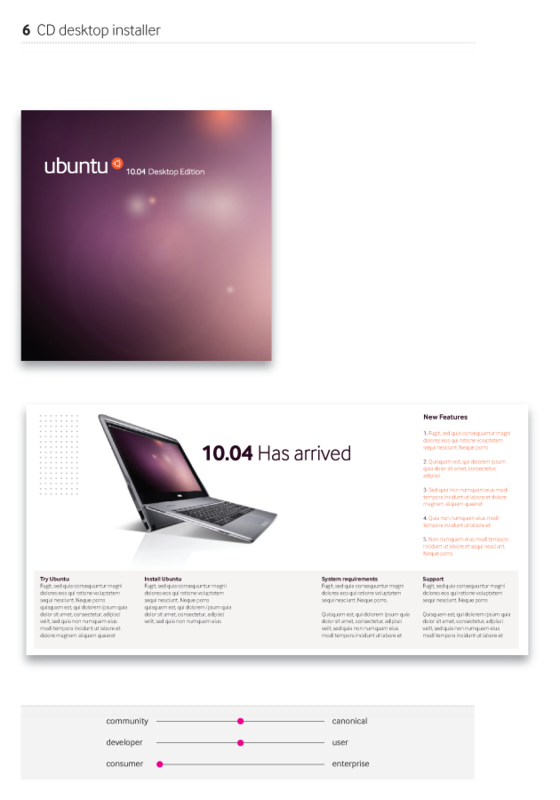 Jono Bacon, Alan Pope, and many others have written, yesterday we published a new visual story and style for Ubuntu. The core design work was lead by Marcus Haslam, Otto Greenslade and Dominic Edmunds, who are the three visual artists leading our efforts in the Canonical Design team. Once we had the base ideas in place we invited some anchor members of the Ubuntu Art community to a design sprint, to test that the concept had the legs to work with the full range of forums, websites, derivatives and other pieces of this huge and wonderful project. And apparently, it does! One of the real challenges for us has been to find a branding and design strategy which spans the spectrum of audiences, forums and dialogues that we cover. With Ubuntu, it’s my specific dream to find a constructive blend of commercial and community interests, not only for Canonical but for other companies. 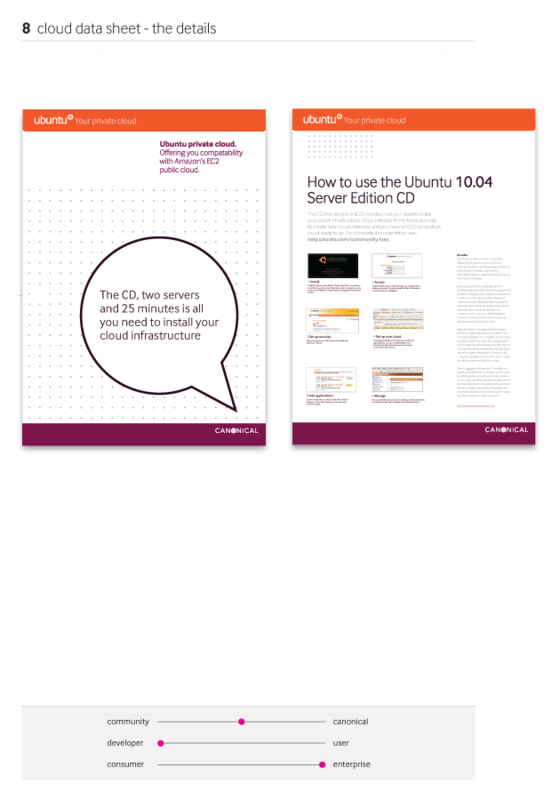 That has made our design and branding work difficult – the distinctive look of Ubuntu lent itself well to pure community messaging, but it was hard to do a brochure for Canonical data center services for Ubuntu on servers. We have not only Ubuntu, but also Kubuntu and an important range of derivatives that all have a role in our ecosystem. We found a set of ideas which each represent those spectrums, and which work together. For example, we identified a palette which includes both a fresh, lively Orange, and a rich, mature Aubergine, which work together. The use of Aubergine indicates Commercial involvement of one form or another, while Orange is a signal of community engagement. The Forums will use the Orange elements more strongly, and a formal product brochure, with descriptions of supporting services, would use more of the Aubergine. On the consumer/enterprise spectrum, we took inspiration from the aerospace industry, and identified a texture of closely spaced dots. When you see more of that, it means we’re signalling that the story is more about the enterprise, less of that, and it’s more about the consumer. Of course, there are cross-overs, for example when we are talking about the corporate desktop, where we’ll use that closely space dot texture as a boundary area, or separator. We also identified shades of Aubergine that are more consumer, or more enterprise – the darker shades mapping to a stronger emphasis on enterprise work. And on the end-user / engineer spectrum, we took inspiration from graph paper and engineering blue prints. When you see widely spaced patterns of dots, or outline images and figures, that’s signalling that the content is more engineering-oriented than end-user oriented. And finally, we found a number of themes which enhanced and echoed those ideas. We use a warm gray supporting colour to give shape to pages and documents, and we built on the dots and circles to create a whole style for figures, illustrations and pictograms. The beauty of this is that we can now publish content that spans the full range, and we generally know when we start the design process what sorts of visual cues we want to be signalling. Instead of having these different mental domains fight with one another, we can now convey quite subtle collaboration between community and corporate, or work which is aimed at engineers and developers from enterprises as opposed to developers working with consumers. Time will tell how it shapes up, but for now I’m celebrating the milestone and the efforts of the team that pulled it together. There’s something there for everyone who wants to participate in the great hubbub of Ubuntuness that is our shared experience of free software. So, for example, here’s a conference banner. The strong use of Aubergine suggests that it’s more corporate messaging (Canonical is heavily involved). Orange is used here more as a highlight. The Aubergine is darker, and there’s quite a lot of the fine dot pattern. Below the image is a set of scales showing where on those spectra this work is pitched. 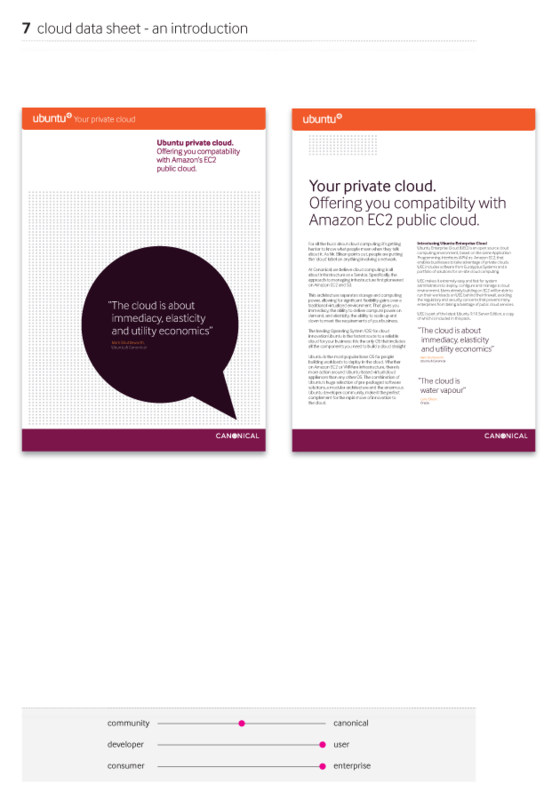 As another example, here’s a brochure with an emphasis on end-users who are thinking about adopting Ubuntu’s cloud infrastructure. Again, the fine dot patterns suggests a more enterprise focus, as does the use of the dark aubergine. You can see the circle metaphor used in the quote callout. And here’s a similar brochure, but with a more developer or engineering oriented focus: note the use of the graph-paper theme with wide spaced dots, and outline shapes. As you can see the idea is to signal a mix of both community and Canonical involvement in the message, addressing consumer audiences with a mix of developers and end-users. We have commissioned a new font to be developed both for the logo’s of Ubuntu and Canonical, and for use in the interface. The font will be called Ubuntu, and will be a modern humanist font that is optimised for screen legibility. It will be published under an open font license, and considered part of the trade dress of Ubuntu, which will limit its relevance for software interfaces outside of Ubuntu but leave it free for use across the web and in printed documents. It will take a few months for the font to be finalised, initial elements will be final in the next week which will be sufficient for the logo and other bits and pieces, but I expect to see that font widely used in 10.10. The work has been commissioned from world-renowned fontographers Dalton Maag, who have expressed excitement at the opportunity to publish an open font and also a font that they know will be used daily by millions of people. Initial coverage will be Western, Arabic, Hebrew and Cyrillic character sets, but over time we may be able to extend that to being a full Unicode font, with great kerning and hinting for print and screen usage globally. We are considering an internship program, to support aspiring fontographers from all corners of the world to visit London and work with Dalton Maag to extend the font to their own regional glyph set. The critical test of the font is screen efficiency and legibility, and its character and personality are secondary to its fitness for that purpose. Nevertheless, our hope is that the font has a look that is elegant and expresses the full set of values for both Canonical and Ubuntu: adroitness, accountability, precision, reliability, freedom and collaboration. We’ll publish more as soon as we have it. It’s been an exciting process, but I have the sense that we are just getting started. The language will get richer, we will find new things that we want to communicate, and new treatments and visual themes that resonate well with these starting points. We’ll find new ways to integrate this on the web, and on the desktop (look out for the two new themes, Radiance and Ambiance). I hope we’ll see the language being used to good effect across everything we do, both commercial and community oriented. There’s a range of expression here that should be useful to artists across the spectrum. Let me know how it works for you.